Having your bull terrier puppy know a few basic commands can be really beneficial, especially when you are trying to correct or prevent troubling behaviors. While you can attend classes with your puppy, there are other methods that also work well. With the right attitude, you can make training your dog a fun and rewarding experience for both of you! Here are 5 basic commands that you should teach your puppy. Teaching your dog to sit is one of the easiest obedience commands. Therefore, it is one of the best ones to start with when training your puppy. Hold a treat close to your puppy’s nose. Slowly move your hand up, causing their nose to follow the treat and their bottom to lower to the ground. Once in the sitting position, give the command “sit” and then the treat, followed by plenty of affection. Repeat this a few times a day until your dog can sit on command without a treat. Start to ask your puppy to sit before eating dinner, going out the door, leaving on walks, etc. This is a crucial command for your puppy to know. Place your dog’s leash and collar on them. Get down to their level and say “come,” while gently pulling on their leash. When your puppy comes to you, reward him with copious amounts of affection and a treat. Once your puppy has mastered the command with the leash on, remove the leash and continue to practice the command in a safe and enclosed area. “Down” is one of the harder commands for your dog to master. Dogs resist this command because it is a submissive position. By keeping the training positive and relaxed, especially if your dog is fearful or anxious, can really help. Find a treat that smells really good, holding it in your hand with your fist closed. Hold your closed fist near your dog’s snout. Once they start to sniff the treat, move your hand down toward the floor, keeping your hand in front of their nose so that they follow your hand. Once down, slide your hand along the ground, away from him, encouraging his body to follow his head. Once his body is down, give the command, “Down”, and reward him with treats and lots of affection. Repeat the process over and over again every day. If your dog tries to sit up or lunges toward the treat, say “No” and pull your hand away. While you might be tempted, don’t push your dog into a down position. Encourage them with every step. Slowly take a couple steps backward. If your dog stays put, reward him with a treat and affection. Gradually increase the distance between you and your puppy before giving them a treat for staying. Always reward your puppy with a treat and love for staying, even if it is only for a few seconds. Staying is an exercise in self-control that your dog must learn, but it will take consistent practice. Don’t get discouraged, as this command will take time for your puppy to master. Learning to stay can be especially difficult for puppies and dogs with high energy levels. Teaching your puppy to leave an object alone can help keep them safe when their curiosity gets them into trouble. The goal of teaching your puppy to leave something is that they will get something better for ignoring the item. Let them lick, sniff, mouth, paw, bark and try to get to the treat inside—ignore their behaviors. Once they start to ignore the hand, give them the treat from the other hand. Repeat the steps until your puppy starts to move away from your hand when you give him the command. 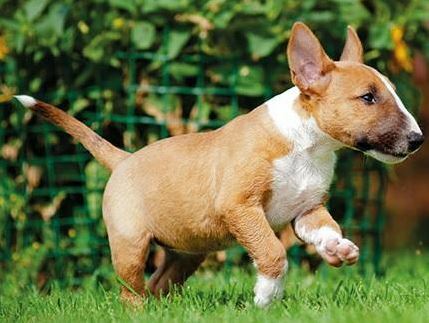 Teach your bull terrier puppy these basic commands when they are young. Be patient and stay consistent to ensure that your puppy learns these commands and listens the first time you give them.